The radical changes wrought by the rise of the salon system in nineteenth-century Europe provoked an interesting response from painters in the American South. Painterly trends emanating from Barbizon and Giverny emphasized the subtle textures of nature through warm color and broken brush stroke. Artists’ subject matter tended to represent a prosperous middle class at play, with the subtle suggestion that painting was indeed art for art’s sake and not an evocation of the heroic manner. Many painters in the South took up the stylistics of Tonalism, Impressionism, and naturalism to create works of a very evocative nature, works which celebrated the Southern scene as an exotic other, a locale offering refuge from an increasingly mechanized urban environment. Scenic Impressions offers an insight into a particular period of American art history as borne out in seminal paintings from the holdings of the Johnson Collection of Spartanburg, South Carolina. 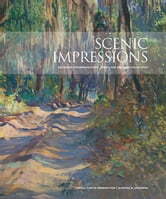 By consolidating academic information on a disparate group of objects under a common theme and important global artistic umbrella, Scenic Impressions will underscore the Johnsons’ commitment to illuminating the rich cultural history of the American South and advancing scholarship in the field, specifically examining some forty paintings created between 1880 and 1940, including landscapes and genre scenes. A foreword, written by Kevin Sharp, director of the Dixon Gallery and Gardens in Memphis, Tennessee, introduces the topic. Two lead essays, written by noted art historians Estill Curtis Pennington and Martha R. Severens, discuss the history and import of the Impressionist movement—abroad and domestically—and specifically address the school’s influence on art created in and about the American South. The featured works of art are presented in full color plates and delineated in complementary entries written by Pennington and Severens. Also included are detailed artist biographies illustrated by photographs of the artists, extensive documentation, and indices. Featured artists include Wayman Adams, Colin Campbell Cooper, Elliott Daingerfield, G. Ruger Donoho, Harvey Joiner, John Ross Key, Blondelle Malone, Lawrence Mazzanovich, Paul Plaschke, Hattie Saussy, Alice Ravenel, Huger Smith, Anthony Thieme, and Helen Turner.